Rowe’s Wharf is, without doubt, one of the most beautiful developments on Boston’s waterfront. With its highly visible arch that connects Atlantic Ave to the harbor itself, it has become a landmark against which you can judge your placement in relation to other points of interest. Should you walk through that majestic archway, you can find a marina, restaurants, a water transportation terminal, and a floating stage offering free concerts and movies during the summer. You can take a ferry to Hingham or a water taxi to Logan. It is a strong addition to the New Boston. But is it really an addition? When the Boston, Revere Beach, and Lynn Railroad was built in 1875, a ferry connector to the Railroad’s southern terminal in East Boston was established at Rowe’s Wharf. 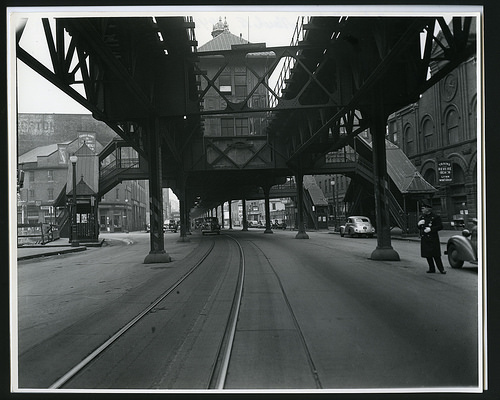 Then, when the nation’s first subway system was constructed in 1901, a stop on the Atlantic Ave elevated tracks was created at Rowe’s Wharf, connecting the wharf to the city-at-large. Boston was then a major East Coast port and point of trade. However, for reasons unclear to this blogster, by mid-century, Boston had lost much of its lustre as a viable port of call. The railroad to Lynn closed, the Atlantic Ave elevated closed, and Rowe’s Wharf was left to twist in the water, weather and wind, causing it and the surrounding area to quickly fall into delapidation. Perhaps New York had left us capsized. In any event, our major point of entry from the Atlantic became irrelevant and seemingly was lost to time.